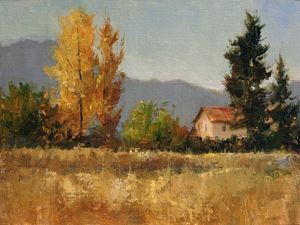 The winning painting is #3, "October Fields" by PAPNM Master Signature Member, Peggy Immel. Online Contest Coordinator, Nita Harper, nita@nitaharper.com. 9. Leslie Thornton, Humble Portal to Faith; 18" x 24"; Oil on Canvas; Mission San Jose in San Acacia. 26. Mark Akins, Warner's Gold 20x24 oil Warner Lake in the La Sal Mountains, Ut.